Omega 3 fatty acids have been getting a lot of publicity in the recent past than any other fat. Its uniqueness is being advertised in TV ads and radio infomercials. A lot of omega 3s publicity focuses on nutritional supplements and not food. I will on this page give some fresh look on how to plan your meal so that you get more omega 3 fats. Omega 3s are essential fatty acids that are classified under polyunsaturated fatty acids, or PUFAs. The most important and common feature among PUFAs including omega 3 fatty acids is that they contain "double bonds" in their chemical structure. The double bonds are a unique connection that makes them highly interactive and flexible fatty acids. These bonds also make them delicate and vulnerable to damage. All polyunsaturated fatty acids have at least 2 double bonds. However, omega 3s are different in that the position of their bonds is unique and not present in other fatty acids. Amongst omega 3s, alpha-linolenic acid or ALA is the simplest. Like majority of vitamins, our bodies do not manufacture ALA. Thus it is very important in our daily diet. You can either get ALA from your diet, or you do not have enough of it in your body. Some people are privileged to eat regularly animal and plant foods that have ALA. 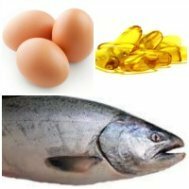 The other types of omega 3 fatty acids, eicosapentaenoic acid (EPA) and docosahexaenoic acid (DHA), are not hard to get. THis is because under normal circumstances, the body converts ALA into the other omega 3s. ALA is not complicated like other omega 3s. EPA and DHA are more complicated, they have five double bonds and six double bonds respectively. Research studies records that EPA and DHA provides more health benefits than ALA. This includes supporting many body systems while reducing the risk of many chronic diseases. So there is no doubt that you need EPA, DHA and ALA to be healthy. We must consume foods rich in ALA since our bodies do not have the ability to manufacture it. Then what of DHA and EPA? Must I eat foods that contain EPA and DHA? The answers to these questions are very important since they affect the foods that we eat. If you eat foods rich in ALA - and you trust your body to make the other omega 3s - then you become free to choose any kind of food you like, including a pure vegan diet that has no animal food. The reason for this is because many plant foods have small to moderate quantities of ALA. However, EPA and DHA can be obtained directly from food. This means you restrict yourself to those foods that contain these omega 3s. For example, sea plants and some fermented foods (like fermented soy food) are good sources. ALA is an anti-inflammatory agent. It promotes good immune system and prevents the damage of arterial wall. Flaxseed oil is known to be a good source of ALA. The dark green, leafy vegetables and some other vegetable oils also provide the ALA. Walnuts are another source of ALA. The body can convert ALA to EPA. However, people living with diabetes or schizophrenia lack the capability to convert ALA to EPA. Therefore they should ensure that they consume enough omega 3 from foods. This comes from oily fish such as tuna, rainbow trout, kackerel and salmon. EPA is a key component of omega 3s. One of its roles is to maintains the brain cell membrane. DHA also a vital component of fish and the fish oil. Its role is to maintain brain cell membrane integrity. The body cannot manufacture it and hence it must come from our dietary sources. LA is an omega-6 fatty acid which is present in most vegetable oils. Experts say that the consumption of LA has doubled compared to the last few decades. If you consume excess amounts of LA, you might have side effects including high blood pressure and high water retention. OA is an omega-9 fatty acid and it is the major fatty acid found in olive oil. Flaxseed also has small amounts of OA. This fatty acid is also found in other polyunsaturated fats. There is no established, daily recommended allowance for omega 3s. However, a healthy diet that contains enough quantities of omega-3 is to be desired by everyone. Researches echo that the ratio of omega 3 to omega 6 ought to be 1 is to 1. If you have realized the reality of our common diet, the ration of omega 6 and omega 3 is from 10:0 to 40:0. You need not to worry about this, there is hope for you. You just need to increase omega 3 foods in your diet and reduce omega 6 foods. Most omega-6 come from vegetable oils. So reduce your consumption of these foods, while increasing your intake of fish and fish oil supplements which have lots of omega 3s. The growth and development of a fetus brain required omega 3s. So a pregnant woman should take omega 3s regularly to ensure normal growth and development of the fetus. The American Heart Association recommends that individuals with high blood fats can benefit much by taking 2 to 4 grams of EPA and DHA every day. Other studies have established that you can reduce chances of dying from a heart disease, and stroke by consuming 0.5 to 1.8 grams of EPA and DHA every day. Individuals suffering from high triglycerides should consume two to four grams of omega-3s daily. Remember that EPA and DHA omega 3s maintains your nervous system and the brain cell membranes. On the other hand, the ALA maintains the arterial lining integrity. For these reasons, we need all these types of omega 3s so that all our body systems can function normally. There are no toxins that are consistently related to a diet high in omega 3 fatty acids. Omegas 3s are heavily packed with calories just as it is with any fatty acids. This means that too much of it can lead to weight gain. However if you cut on high fat foods while maintaining an omega 3 rich diet, you will not exceed on the calories. In most cases, it is non-omega 3 fats that we take in excess. Researchers suggest that it is possible that you take a lot of omega 3 fats than omega 6 fats which can lead to an omega 6 deficiency. However, it is clear to researchers that chances of such a scenario are very rare. Diets that are high in fish are faced with a significant concern about their risk of exposure to environmental toxins. Mercury in the form of methymercury, is at the top of the list of these toxins. Variable levels of mercury are present in lakes and oceans, either naturally occurring or due to pollution. This mercury tends to builds up through the food chain and is more concentrated in large fish that eat other fish or animals. Since it is easy to predict local mercury concentrations, then it is possible to know with relative sureness the species of fish to avoid. Pregnant women and little children should avoid mercury exposure because it is very problematic to them. Research studies have linked high levels of mercury to mild delays in child development.